The Border Peepshows provide four views of the political separation of a culturally and ecologically connected terrain. Drawing on historic and contemporary photographs of the region, each box depicts scenes of San Diego/Tijuana from 1887, 1927, 1967, and 2017. Design of the Border Peepshows references 18th-century parlour toys and the 19th century cameras that first photographed the SD/TJ border. 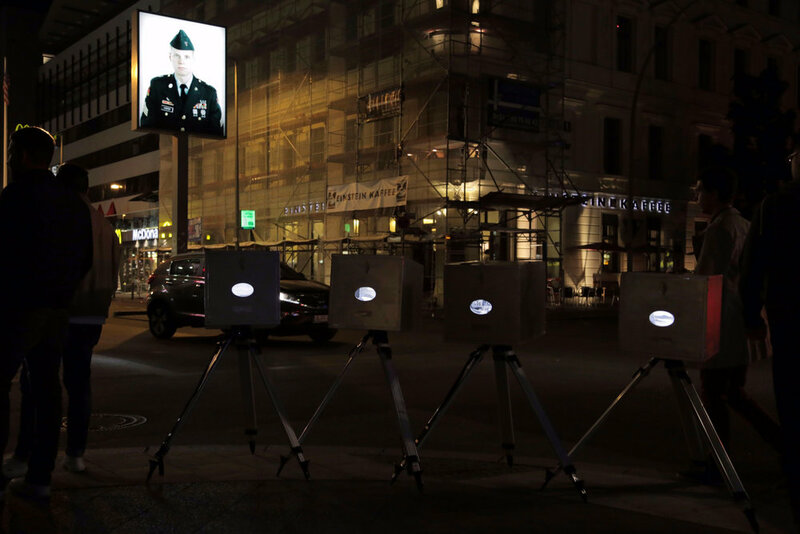 First shown in San Diego and Los Angeles, the Peepshows now travel to other parts of the world to mark borders of the past and present, including the former East/West Berlin Wall. The Peepshows serve as an interpretive tool to discuss borders and their relationship to people, land, and time. “A Border Peepshow” is a collaborative project between Parkeology and The Velaslavasay Panorama. Parkeology is a public art program that excavates histories from urban parks and museums through live interpretive events. The Velaslavasay Panorama is an exhibition hall, theatre and garden dedicated to the production and illumination of unusual visual experiences, including the 360-degree painted panorama.